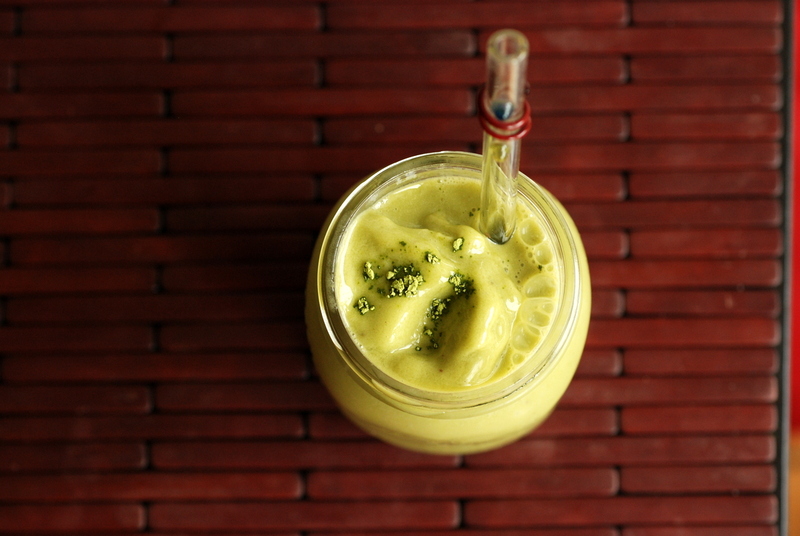 Matcha Ginger Smoothie & Cookbook Giveaway! It took me awhile, but I finally succumbed. Caffeine: sometimes, I need a little extra oomph in the morning. I made it through university, medical school and a 5-year residency before I contemplated caffeine. A few months into my fellowship, with its longer hours, I started with a bit of green tea. I am not drinking coffee or black tea (I actually don’t like the taste), but Rob and I both knew something was up after we scoped out green tea for me to drink while in Mexico. Three days with a morning green tea latte. Just the trickle of caffeine was able to fuel me throughout the day, though. Rob and I powered through multiple markets (food and general markets), biked around midtown, visited cathedrals, admired public murals, walked around Frida Kahlo’s home, cheered for Mexican wrestlers (ok, maybe we just watched) and our most anticipated event: walking up ancient pyramid ruins outside Mexico City. We left Houston, and its cold weather, and thankfully, by the time we returned, it was back to its glorious warm self. I am back to cycling in shorts. I know, this may not be the most seasonal recipe for those in a winter climate, but I have been enjoying a multitude of smoothies since I received Kathy’s cookbook, 365 Vegan Smoothies. Each weekend, after our standard cycle adventure, I would return home for a frosty drink. I’d leaf through and pick a new smoothie each week. I quickly learned that I had to plan my smoothie in advance. Sometimes, I had a hard time deciding which smoothie to make! So many options, so little time. 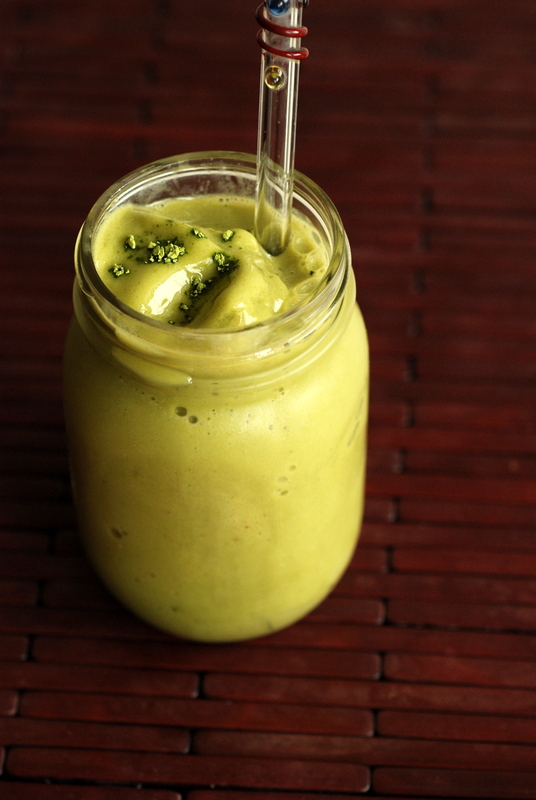 However, once I made this Matcha Ginger Smoothie (the ever-creative Kathy named it Matcha Ginger An-Tea-Oxidant Shake), (Rob and) I knew it was the winner. The one I would photograph and share with you. Creamy and sweet frozen bananas complement the bitter green tea matcha, but the best part was the ginger twist. 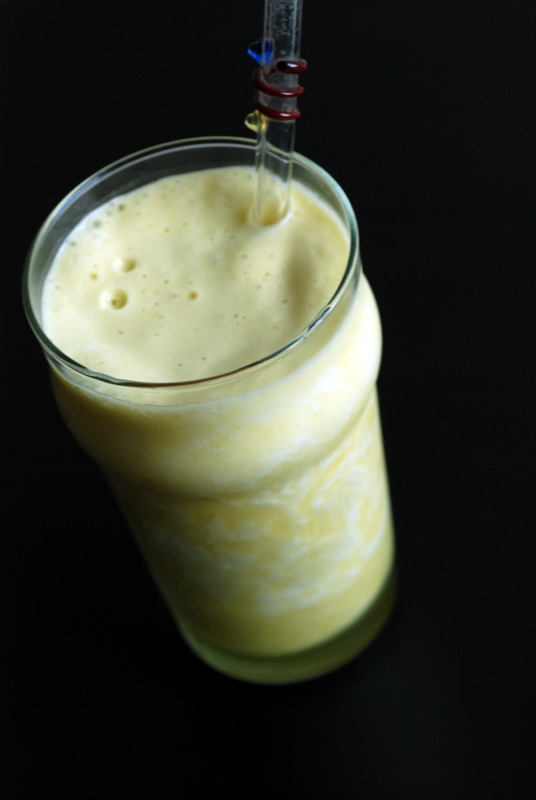 Kathy suggested using a dash of ginger powder, but sharp flavour from fresh ginger is unbeatable in this smoothie. A high speed blender would have no problems whipping this into a delicious drink. 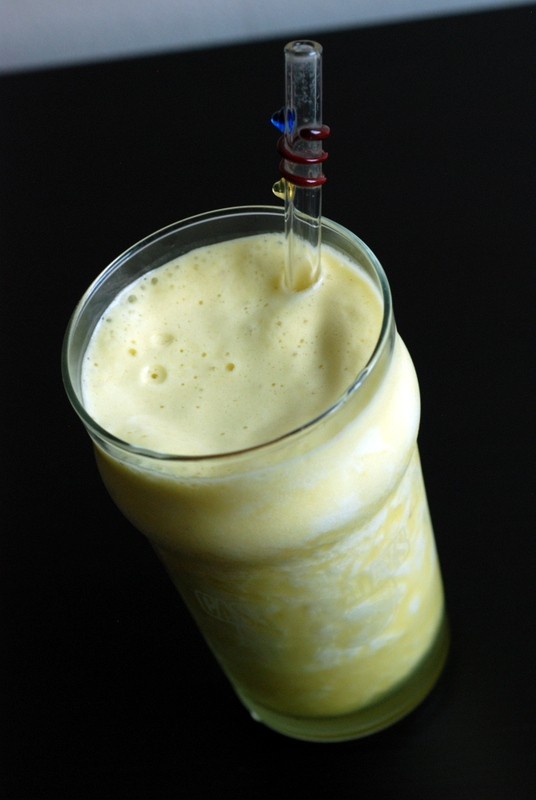 I was not sure whether a smoothie cookbook would be worthwhile, but I have had fun trying out different drinks. With 365 different recipes, you are bound to be inspired by a few new combinations: walnut-carrot cake, jazzy ginger grape, lemon-beet clarifying cooler, maple spice buckwheat shake, mango-cado kale kiss, a-peel-ing chai shake. Her crazy concoctions span smoothies with vegetables, fruit and nuts or non-dairy milk. Occasionally yogurt or fruit juice slips in, too. Thin and frosty, or thick and decadent. All vegan. I also appreciate that nutritional facts are included (all recipes serve 2 but the nutritional contents are for the entire recipe). Beyond the recipes, Kathy is also a fabulous photographer. I find it hard to photograph drinks, but her cookbook is peppered with gorgeous photography. Bright, colourful and tantalizing, signatures of her blog, Happy Healthy Life. It is refreshing to see wholesome ingredients highlighted at their finest. Kathy also takes the time at the beginning to ground you in smoothie creation, with troubleshooting and myths debunked. She also highlights being creative and flexible in the kitchen. I don’t like ice in my smoothies (Kathy is a big fan) but just adjust as you see fit. I really want to share this cookbook with you and thankfully the publisher is letting me give a cookbook to one reader living in the United States. To be entered, please leave a comment here, telling me about your favourite recipe by Kathy. If you haven’t made anything by Kathy yet, have a look through the table of contents of 365 Vegan Smoothies on google books (or my list above or below) or pick something from her blog and tell me what you want to cook the most. I will randomly select a winner on December 11, 2013. Good luck! PPS. There is still time to enter my giveaway for The Simply Raw Kitchen. This is my submission to this week’s Health Vegan Fridays and this week’s Raw Food Thursdays, Virtual Vegan Potluck and this week’s Smoothie Sunday. Have you heard of cronuts? Maybe the dosant? They are both spins on the same baked hybrid: a donut-like croissant. The original cronut wooed New York City. However, they take days to make and minutes to sell out. The lines are long and the prices are high. Since then, a few knock-off dosants have peppered North America. In Houston, they can be found at Pena’s Donut Heaven in Pearland. When Rob discovered this, we had our next cycling destination picked. Turns out, while the cronut was not that fabulous, we’ve discovered our favourite cycling route in Houston, thus far. We’ve pedalled back 3 times already, enjoying the long, flat and straight road leading out of downtown Houston. Of course, Pena’s dosant is not vegan and I oftentimes get giggles from strangers as they see me snacking on an apple while Rob munches on his donut. When we get home, though, I have been mixing up my own fabulous tropical smoothies. We’re working through different frozen fruit pulps. After our trip to Colombia, it was hard to find tropical frozen fruit (mamey, guanabanana, lulo, etc) in Toronto, but we snagged a bunch when we spotted it at Fiesta Mart. 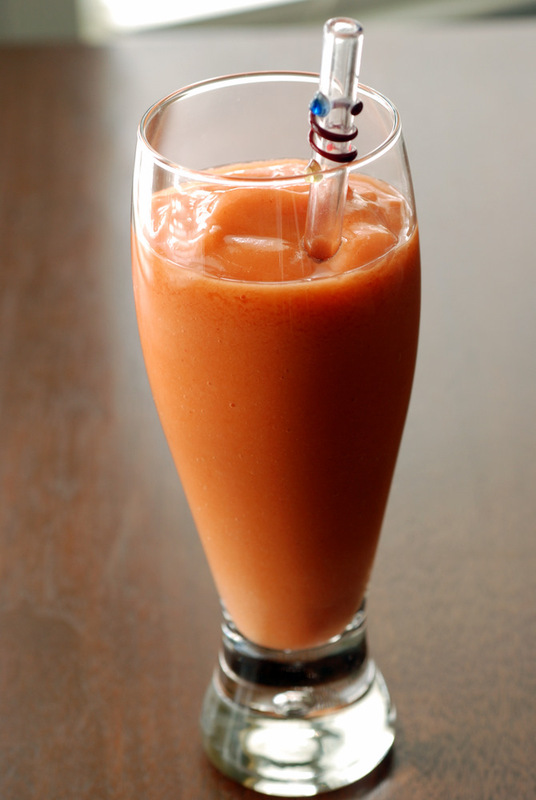 Mamey is still my favourite, but this simple guava smoothie was very good, too. Usually we just drink it and forget it, but this one I remade and photographed because I thought it was perfect to share. 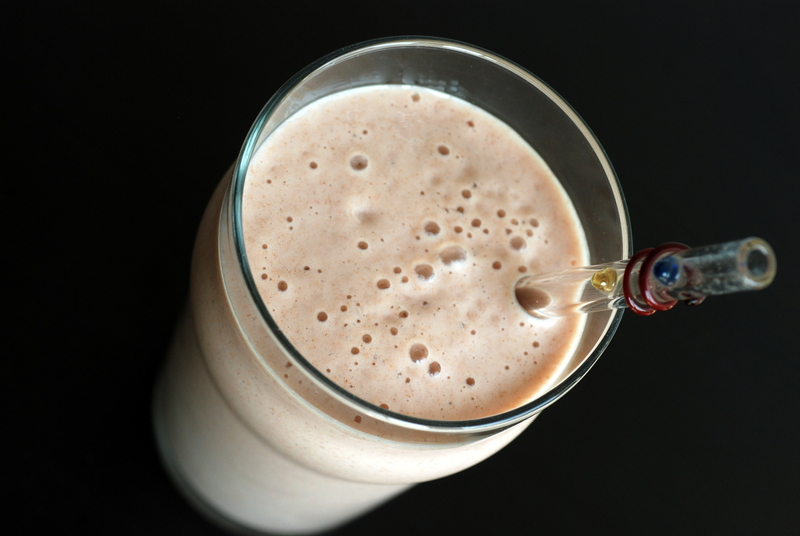 Frozen guava is combined with frozen banana, almond milk and ground flax seeds. 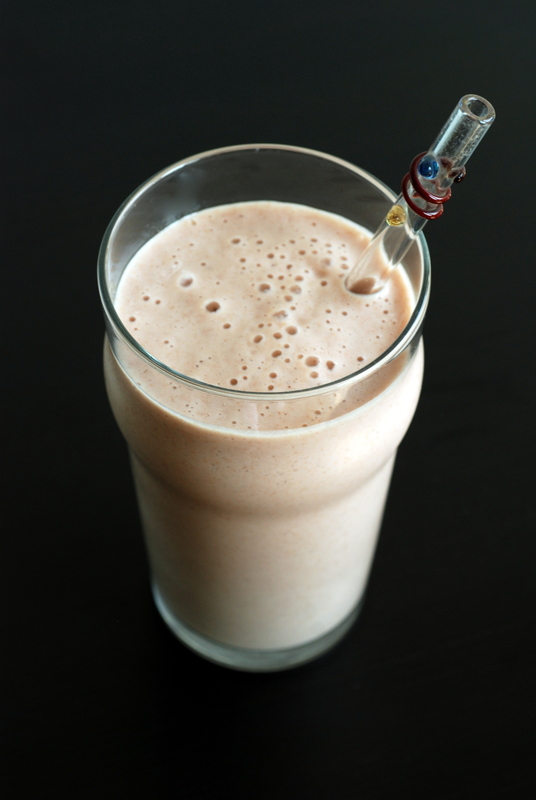 The flax bulk up the smoothie making it more creamy. You may see the small flecks of brown but you can’t taste them. Coming home to a cold drink is definitely the way to go in Houston. Do you have a favourite treat for hot weather? This is my submission to this week’s Raw Food Thursdays. This is just a quick post to tell you about my latest infatuation. That ice cream craving was this week, though. 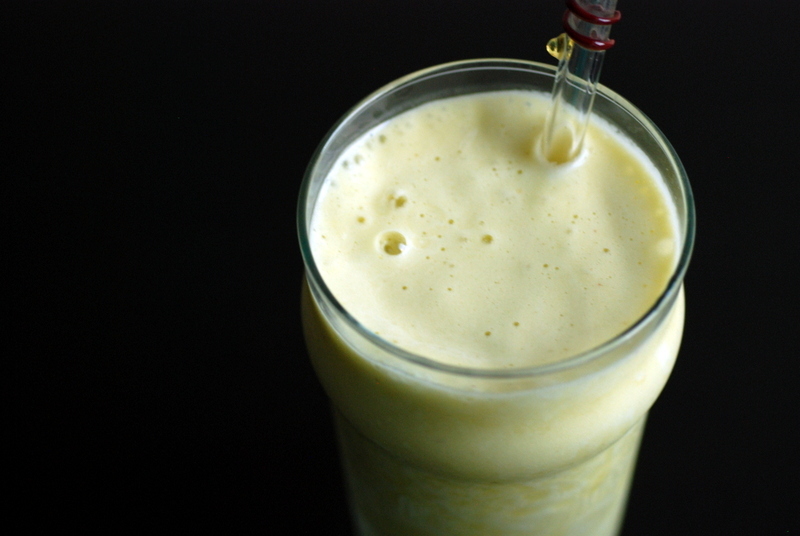 And while this is no ice cream, it is a deliciously creamy banana-less smoothie. And so cold, it gave me ice cream head aches. Yes, this is the perfect drink to slow down with.. on a sunny summery day (thank you beautiful weather, Toronto). Bananas are a common fixture in my smoothies, but Rob has stopped buying bananas, focusing on our freezer fruits. Vegetables are commonly added to sauce to make them smooth (cauliflower, zucchini, sweet potato and roasted tomatoes come to mind), and I have even added carrots to smoothies before (for a strawberry-mango-carrot delight). But this time, I wanted to try cucumbers. They worked well in my Cucumber Beet Ginger juice, so I figured out if someone had done something similar. Now it didn’t seem so scary to pair cucumbers with strawberries. I’ve tried it with the seeds and without, and personally I just can’t be bothered to remove the seeds. To be honest, you cannot really taste the cucumber per se but it gives a fresh feel to the smoothie. I’ve made it with and without the vanilla and both are good. And the lemon juice? Definitely better with it. Definitely a comforting, guiltless drink for the summer. Thank goodness cucumbers are on sale this week. If you pick some up and make this, please let me know what you think… or if you have any other ways to enjoy cucumbers drinks. I was wondering whether they would freeze well for smoothies but ate through all my cucumbers before I could figure it out. Joy says hers feeds two. It serves one Janet. And I’ve drunk my way through 2 cucumbers, if that tells you anything. As I said, I should listen to myself more often. I am full of great wisdom. Another piece of Janet tried-and-true advice: follow the recipe! I know I adapt many recipes to what I have on hand, but some recipes are best left untouched. Case in point: traditional hummus. I already have a recipe I love (LOVE!) and see no need to experiment. Winging it ends up with a subpar hummus. For some reason, I also find juices and smoothies to be a bit finicky. Sure, I can wing random smoothies and juices, but sometimes the proportions are off, some flavours aren’t properly balanced and gosh, I know it can taste better. Hence why I am sharing this recipe. It turned out great. When I winged this with raspberries, flax and protein powder, it was ok but not fabulous. 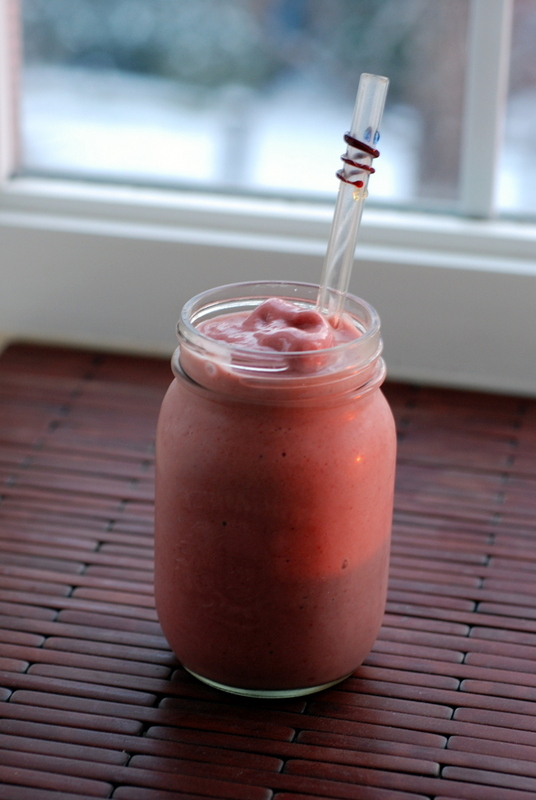 Raspberries are more tart than strawberries and while I used flax seeds as my milk substitute, almonds and hemp seeds create a more lusciously, creamy drink. I still tinkered with the original recipe but not by much. 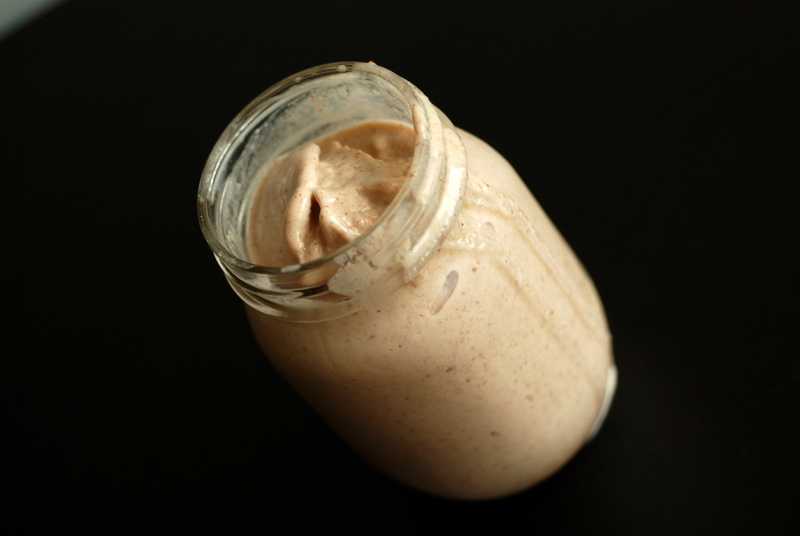 Next time, I will add some protein powder, which can easily be hidden inside a smoothie. 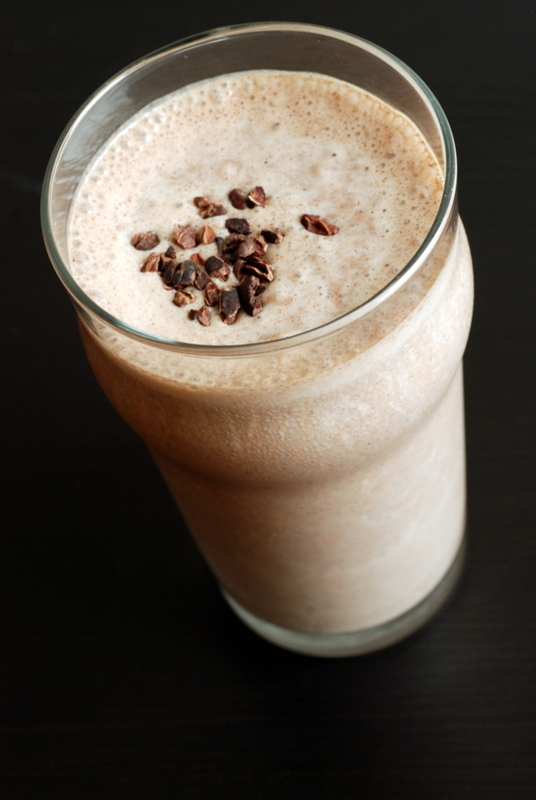 I have eaten at Gorilla Foods a few times when visiting Vancouver and this shake is definitely one of my favourites. I found most of their dishes to be a bit lackluster although I thoroughly enjoyed their Main St. Monkey Sandwich: a raw squash-curry bread filled with olive tapenade, creamy mashed avocado, zucchini hummus, tomatoes, cucumber and sprouts. I thought there was raisin chutney, too, but I could be mistaken. In any case, it was a delicious sandwich to try if you are in their neighbourhood. I often try to recreate resto meals. Inspired by Gorilla Foods, I’ve made a (non-raw) kabocha squash curried flatbread, but filled it with eggplant bacon as a BLT. Their raisin chutney has been on my hit-list, though. Although their guacamole recipe is in Thrive Foods, it wasn’t until they released their cookbook, that nearly their entire menu was available to be made at home. We’re all out of raisins, though, so I started by making this smoothie. And as I already said, I wasn’t disappointed. 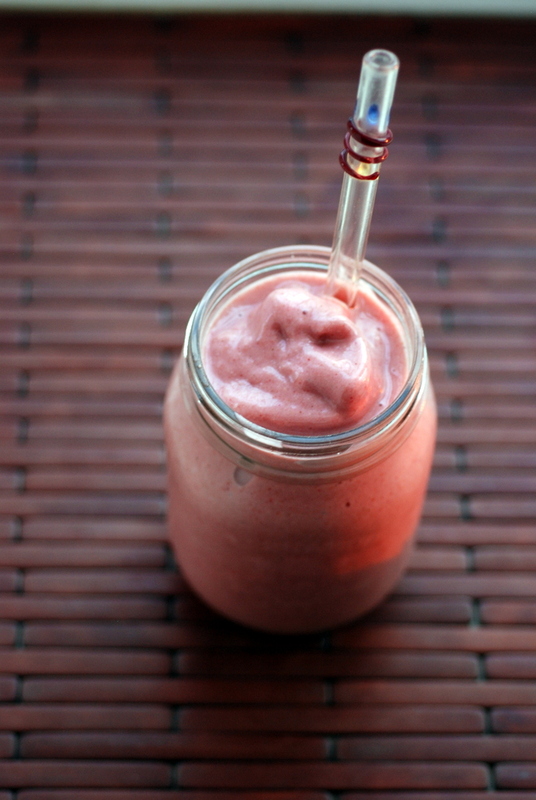 Sweet creamy strawberries with a hint of malty maca and vanilla. 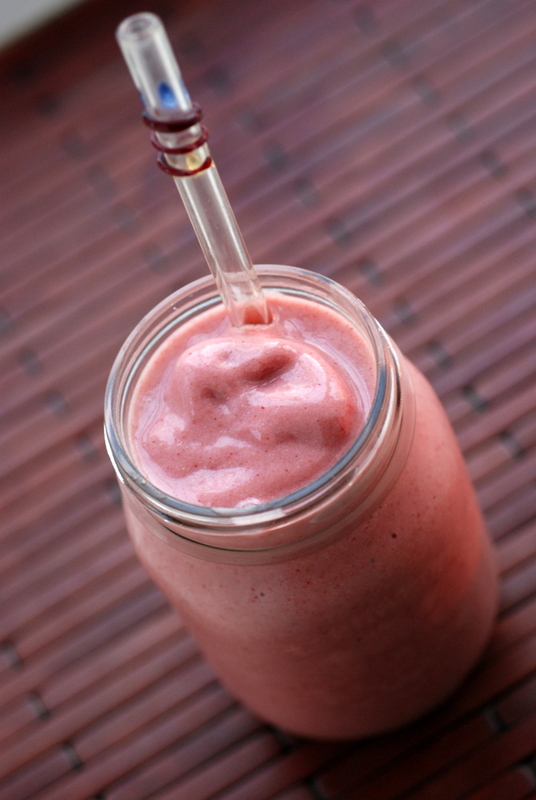 How do you usually make your smoothies? Wing it or measure it? I have to update you on the Vitamix! It is alive and well!! Turns out it has an automatic shut off if the motor is overheating, which can happen when using low speeds. The next morning, I tried it again… and it is all working fine and dandy! 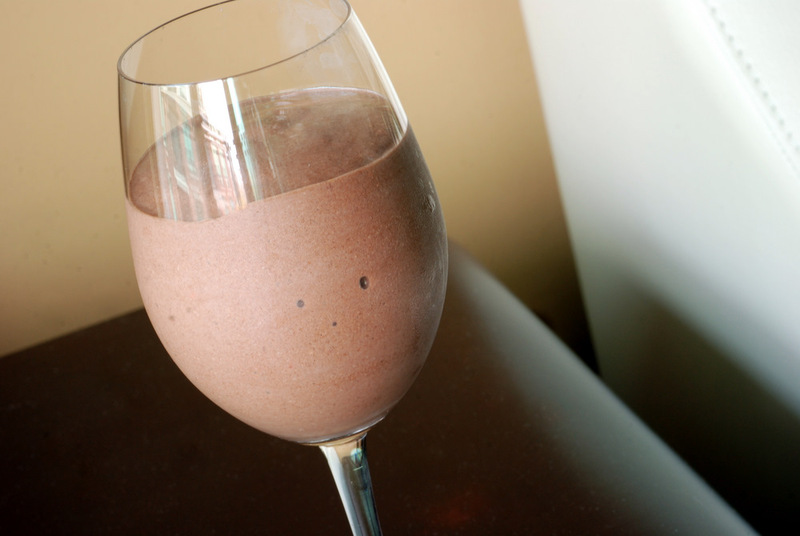 Perfect timing to whip up this fabulous smoothie. The carrot tempers the sweetness from the mango and pineapple juice. It also adds a bit of bulk which I countered with some more water. This is my submission to this week’s Weekend Wellness and to this month’s Berries event featuring strawberries. Rob laughs at me because one of my guilty pleasures is ordering fresh juices and smoothies from restaurants. 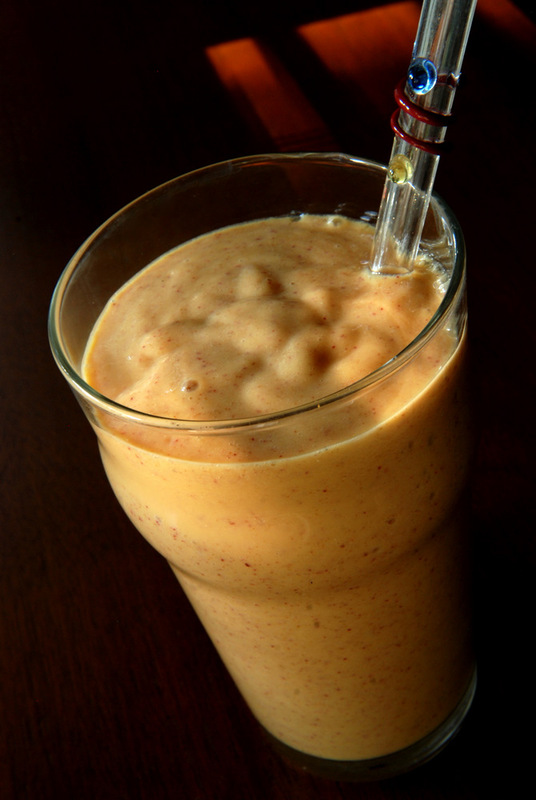 Nothing beats a fresh blend of ripe vegetables, or a creamy smoothie packed with fruits. Feeling guilty about eating something so healthy seems so odd, but when they cost over $5 a pop, that’s when I feel bad. I mean, I could make something similar at home… on the smoothie aspect, that is. Unfortunately my old food processor can’t make fresh juice. But now that I have a high-speed Vitamix blender (wahoo! ), even my smoothies taste better! An immersion blender keeps things a bit on the chunky side, a food processor is better and now I know how the professionals get that secret creamy consistency without the cream (although they could also be adding cream, too, without me knowing). It’s the blender. 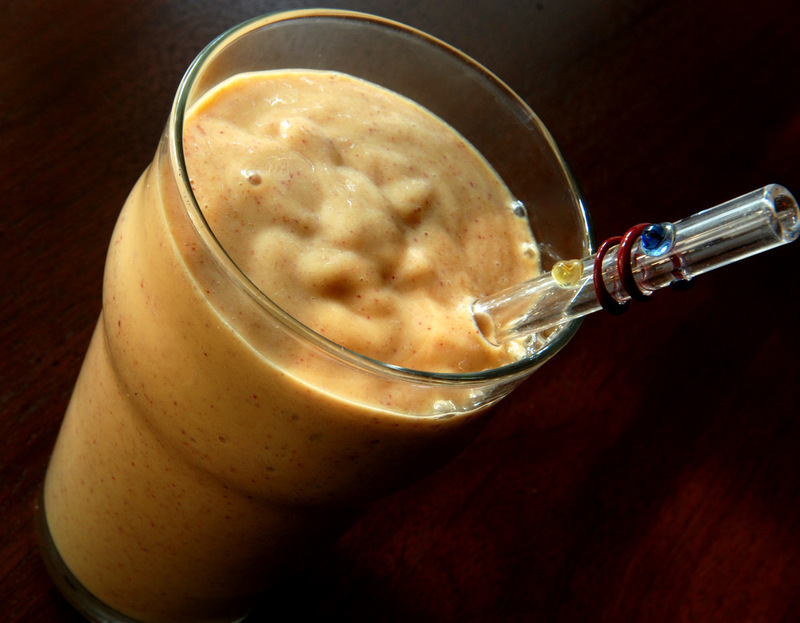 My latest smoothie craze has been devouring local Ontario peaches. 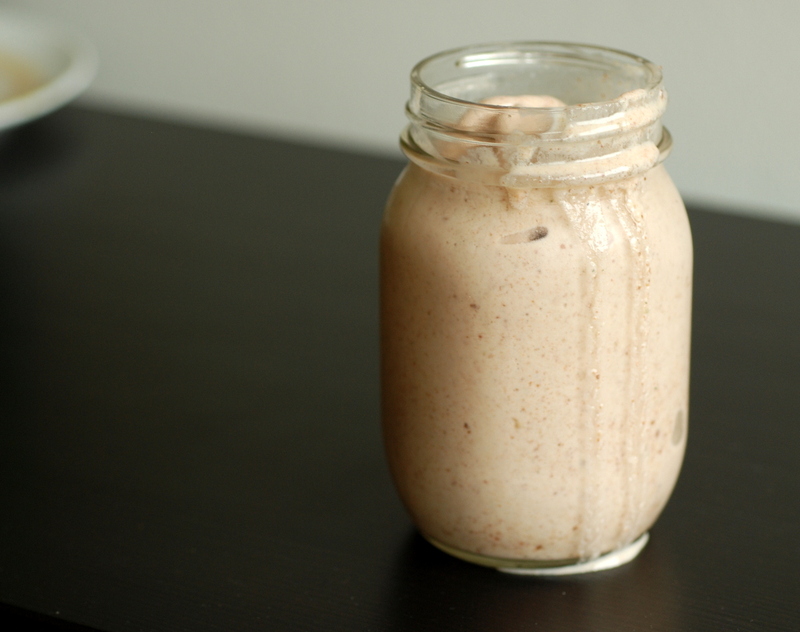 Throw in a fresh, ripe, pitted peach, half a frozen banana, vanilla, chia seeds and some soy milk. Blend to reach creamy peachy bliss. Sip and enjoy! This is my submission to this month’s Veggie/Fruit a Month, featuring peaches, to this week’s Potluck Party for summer drinks, and to Ricki’s Summer Wellness Weekends. I have been a recent convert to breakfast smoothies. I never quite understood why I would want to drink my breakfast. 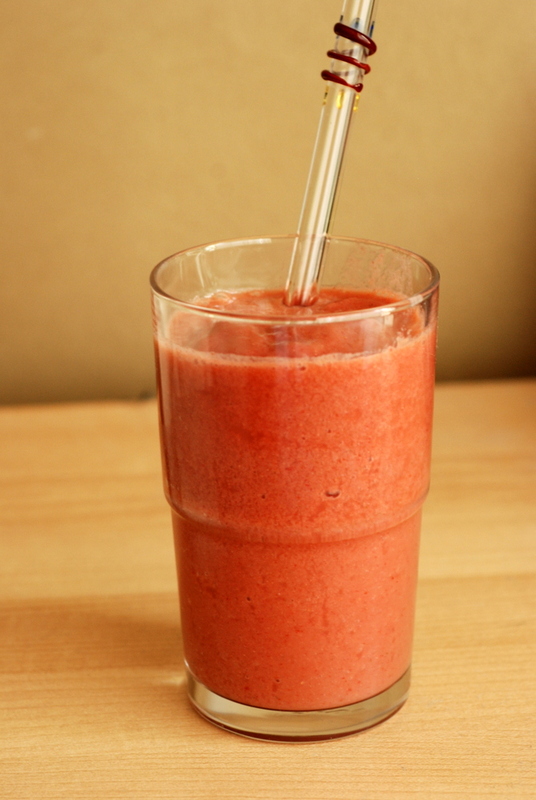 However, chilled smoothies filled with fruit and seasonings have been perfect before and after my bicycle rides. 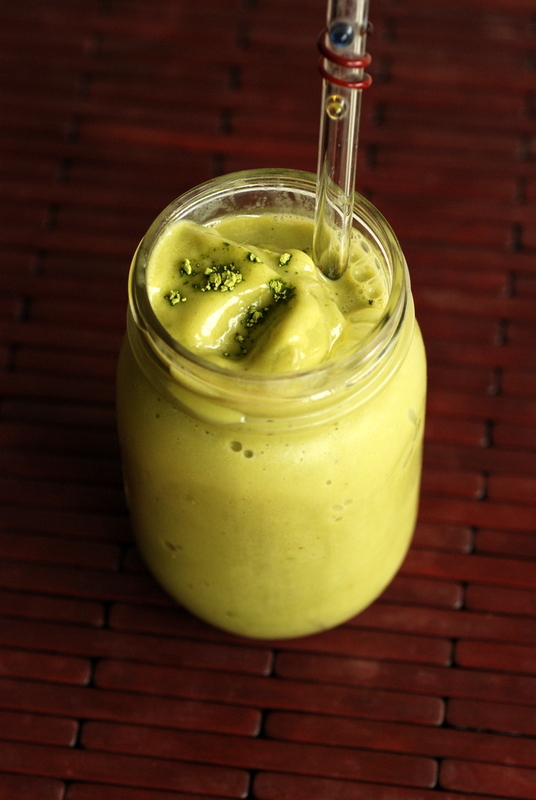 I am currently testing recipes for Tess Challis‘ upcoming superfoods cookbook and have been loving her smoothies! 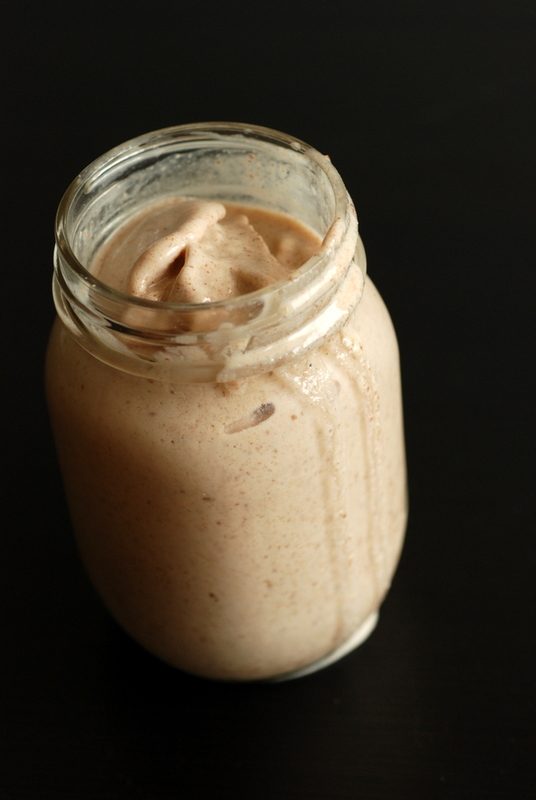 Her “Maca My Day” smoothie is what got me hooked, and it is wonderful with frozen bananas and the malty goodness from maca. 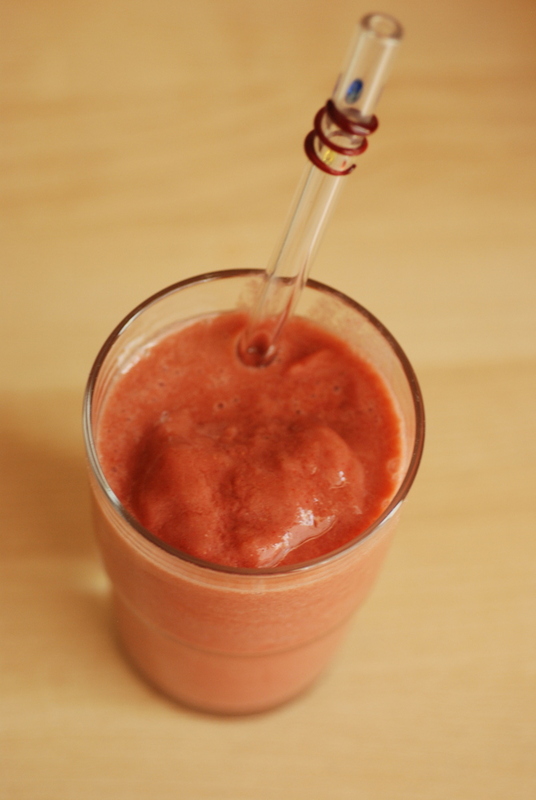 She has a few delicious smoothies planned for the cookbook, and I took some liberty to create my own variation. Perfect for breakfast, a delicious treat for dessert, enjoy this smoothie guilt-free as it is packed with frozen banana, raspberries, chia seeds, toasted carob and vanilla. Chocolate and raspberry pair well together. Except I didn’t use chocolate. 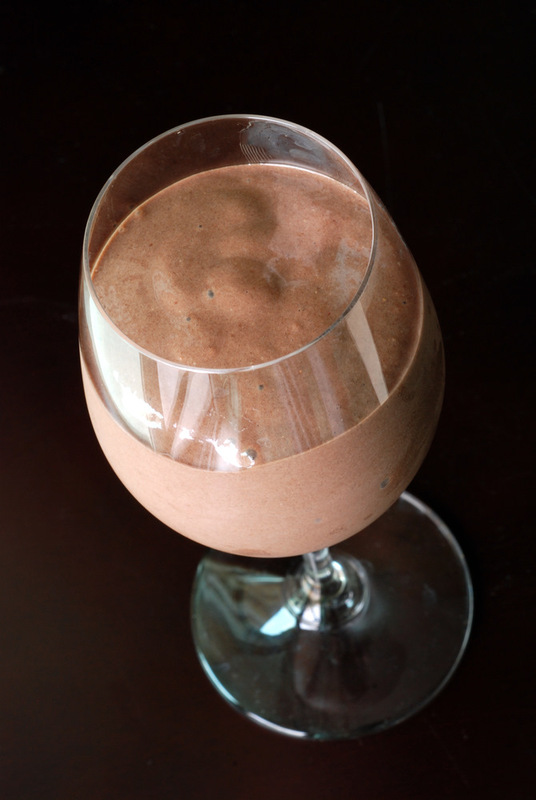 I used toasted carob powder, which has a flavour similar to chocolate without the caffeine. 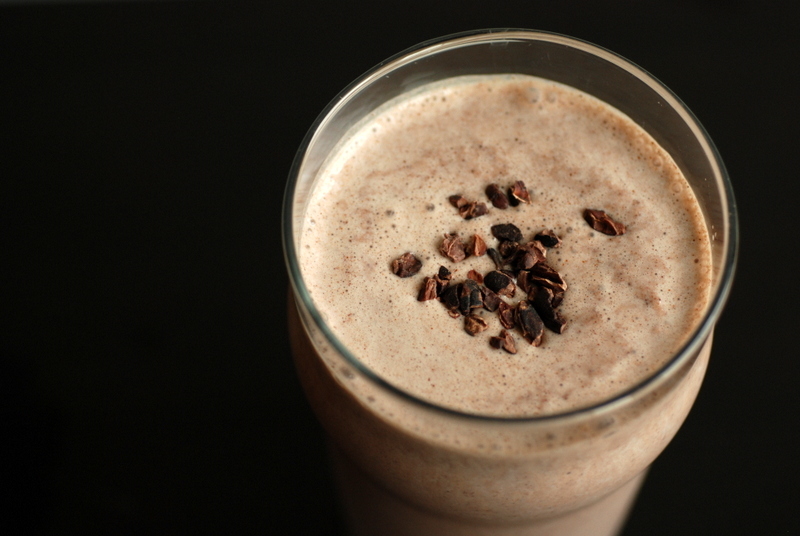 Carob is a bit sweeter than cocoa, and definitely sweeter than raw cacao, so I didn’t feel like this smoothie needed any additional sweetener, but add to taste. Maca is also wonderful in it, but completely optional. This is my submission to both Ricki and Kim’s vegan SOS challenge featuring carob and to this month’s Breakfast Club featuring fairtrade ingredients.